Supplier & Exporter of Cement Plant Elevator Chain. Our product range also comprises of Industrial Couplings, Link Belt Bearing and Elevator Belts. As an affluent name of this domain, we hold expertise in presenting high quality Cement Plant Elevator Chain. The offered chain is made utilizing quality materials. The heavy duty materials offer strength and reliability to the chain when load or unloading task is applied. Additionally, the provided chain is coated with galvanized finish to strength it hold up the high tension readily. Clients can opt to get the chain made and obtain in variety of lengths according to the business requirements. Why Choose Rexnord Elevator Chains? 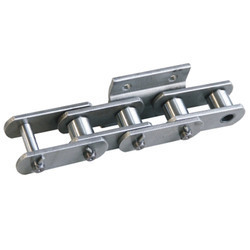 Looking for Cement Plant Elevator Chain ?